My skin has improved so much! I brought this from a recommendation from a friend and It did not disappoint. My skin is cleared, brighter and smoother. I literally can not live with out it now. If this is ever discontinued I don’t know what I’ll do. I use this twice a day, morning and night, so keep my skin clear and blackheads at bay. It isn’t quite as effective as the 2% BHA skin perfecting liquid at blackhead clearing, but it makes up for it by being incredibly gentle and contains lots of soothing ingredients. Please make this in the same size at least as the skin perfecting BHA! Cannot live without this. I really like this product. I believe it has contributed to improving my skin. 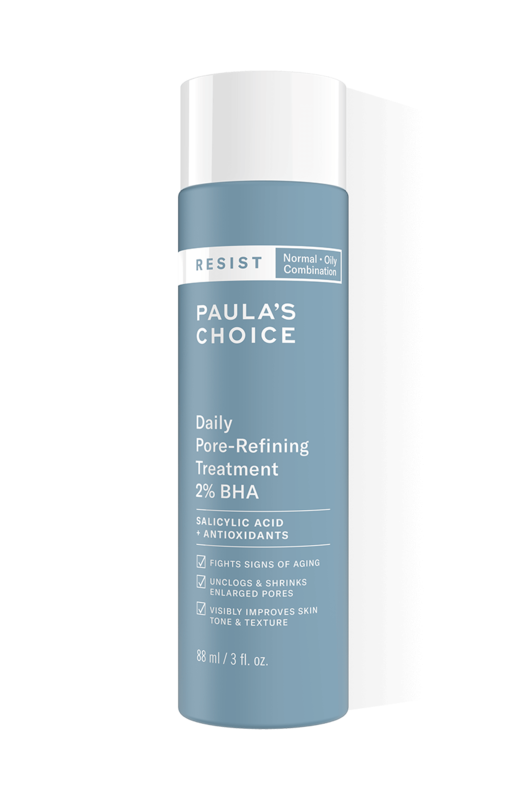 I have been using this for at least a couple of years, I've tried the other BHA exfoliant by Paula's Choice as you get a little bit more product for your money, however, that was too drying for my skin. Sometimes you've just got to stick with what works. After a slight rocky start (few small breakouts) I am now a total convert to this BHA! I tried the calm 1% lotion prior to trying this and felt like it wasn’t doing much for me. I also wasn’t sure about whether the silicones in it were bothering my skin a little. I stopped anything for ages then tried out Resist 2% BHA. Broke out on my forehead at first but I persisted with it and soon was delighted with the results! Resist BHA has improved my skin texture so much, making it much easier to apply makeup to camouflage my redness. My pores look smaller and any bumps have lessened. Also, it clears up the red patches around my mouth! I ran out of this for a while and the red patches came back, skin started feeling congested etc. I tried a sample I had of the Clear BHA liquid which I thought seemed to be pretty much the same thing. But it burned my skin and worsened my redness, no idea why. I then tried going back to the 1% calm BHA lotion, but that had zero effect on the red patches round my mouth. Ordered the Resist BHA again and since starting back on that again the red patches have gone and skin is looking so much better. The only reason I give this product four stars instead of five is the packaging. I have already harped on about this in another review but I just wish P.C. products gave you a bit of style as well as the (brilliant) substance! Maybe I am in a shallow minority but I like using every day products that are super aesthetically pleasing, it just brightens my day a bit! Companies like glossier, Aesop, The Ordinary, Niod, Bobbi Brown etc look so nice. I buy P.C. products because they work but it would be nice if they also had a bit more flair, especially as, whilst reasonable in price, they are not cheap! I really, really like this BHA. Previously I was using an AHA (from a different brand), which made my skin feel very smooth, but didn't help with the under-the-skin lumpy spots I get. Since swapping to this about a month ago, my skin has improved a lot (in fact I'm writing this because one of my co-workers just said she'd noticed my skin looking great! I like that while it's a BHA, it's not drying - I have very dry skin and I haven't had a single flake from using this. That said, it's clearly effective as right now my skin is completely clear (minus a few blackheads, which I'm hoping this will help with over time). I will say that in the second week of using it, I got quite a few small whiteheads - I think it was 'flushing out' the clogs I already had. They cleared off pretty quickly though. I was torn between this and the normal (not Resist) BHA but for my dry, clog-prone skin, this is perfect. Absolute waste of money and effort. No change to my pores or completion at all. I gave it a fair trial to work and missed 30 days guarantee so was unable to return it. Another product cleared the issue in few weeks. I bought the first bottle of regular 2% BHA which worked well on my skin. I have PCOS that means at the age of forty, I still get lot of pimples and blackheads. The first bottle of 2%BHA significantly improved my skin conditions and I thought this resist 2% BHA, more expensive should be a better improved formula . Unfortunately not that doesn't exfoliate my skin, I keep getting outbreak. I am now so reluctant to order from Paula's again. Customer Care: Thank you for sharing your experience, we regret to hear that this product wasn't working for you. Possible our Skin Perfecting 2%BHA Liquid would be a better option. Please contact us should you need further advice. Lorraine - Can't live without it. I am 64 years old and have had troublesome skin since my teens. As you can imagine I have tried every product on the market over the years. I started using Paula's choice in June 2017 and am amazed at the results. It has taken a few weeks but the improvement is amazing, no more breakouts and what 'bumps' I already had have almost disappeared completely. I am so impressed that I bought a full set of products for my 40 year old son. It is amazing and I will never use anything else. Thank you Paula. This BHA exfoliant is one of my favourite Paula's choice products and definitely my favourite exfoliant. It is gentle, no stinging factor whatsoever and I do have very sensitive skin, yet visibly smoothes the skin, making it look visibly younger and dewier. Catherine - Has cleared up my menopausal skin issues!! I have just ordered my third bottle of this along with other products from the Resist anti-aging range and have to say the PC products have literally saved my face. Since starting menopause my skin has been prone to breakouts, my oily tzone has got oilier and I had patches of redness either side of my nose which had to covered with full coverage makeup. My skin took a couple of weeks to see any change but since I have incorporated this product into my regime it has cleared up redness and breakouts, to the extent that I only use a CC cream now. Trini - Improving my ageing sensitive breakout prone skin! Have been using this every night for the last week. It is comfortable on my skin, has not caused any stinging or reactions, and seems to be helping. It leaves my skin feeling and looking good. It has been very difficult to find products suitable for older skin that remains prone to breakouts, so I am pleased with this and have just ordered some more. The night time moisturiser and cleanser in this range are also working well for me. (Interestingly the daytime SPF 50 moisturiser in this range has not suited me at all and I will not be buying that again). Abs - Hands down my fav. PC product! I would give this product 10 starts if i could. It has helped with large pores, uneven skin tone, pre menstrual breakouts. I spent years and £££ on many products and treatments and this product has given me great results. It didn't happen overnight but consistent use has made a huge impact on how great me skin looks! I have been using this for 4 weeks now. I started slowly and built up but my skin has become really red on my cheeks and is very dr. My pores look just the same too so unfortunately it's not for me. This is now an essential product in my routine. It really helps reduce clogged pores and sebaceous filaments and has visibly improved the texture and look of my skin. Can't say it's helped with fine lines at all, but will definitely keep purchasing for its other benefits. I bought the trial size and have used frequently and still have just under half a bottle left! Okay, so I am not good with instructions and after having no problem, I began using this twice a day for about 10 days and then realised that you are supposed to slowly build up usage! Well, I copped it with peeling skin which is totally my bad and unfortunately I haven't been able to reuse this product...yet. What I got from this product is smaller pores on my cheeks, clean skin and it makes the face so smooth whilst it's on as well as when you take it off. Takes awhile to work but when it does you will know it. I recommend this product and hope to be able to use the remainder of it. The only downside of using PC products is DELIVERY! My first delivery took 5 days and my second took 7 days, I've just made my third order and wonder if that will take 9 days? PS: If your products weren't so good I wouldn't get so excited about waiting for them so you're kinda a victim of your own success. What a bonus! Customer Care: Thank your for your feedback. We are sorry to hear of the delivery issues. Orders are being sent from our warehouse in the Netherlands, therefore currently it can take up to 9 work days (weekends and public holidays excluded) for the parcel to reach you. However we are monitoring this closely and hope to be able to offer faster options in the near future. I have oily t zone with large pores and lots of blackheads in that zone. I get dry cheeks and top of forehead. My skin can go very dry at times. Thought I'd try this as am always open to something that says it reduces blackheads- they have been the bane of my life since I was 18 I'm now 34! Definitely reduces pore size and reduces the rate at which I get black heads. My skin looks smoother since using this. I do still have blackheads certainly but I would say after using for around 5 weeks or so now they have reduced. I'm hoping with long term use they will continue to improve. There have been quite a few days where I have not worn foundation, instead just a powder on my skin which is un-heard of for me! So it must be doing something. Only my problem I've encountered twice is dry skin. It's weather that will make my skin have a dry spell but I do find when it happens I've had to quit using this product for a few days as it's been impossible to re hydrate. But once skin is back to normal it's fine. Overall very good and would dfinately re-purchase. I'm 33 with very oily but dehydrated skin with loads of blackheads all over my face and the occasional breakout. After using this product twice daily immediately after receipt, my skin started purging within a few days and I got heaps of little white bumps that turned into tiny white heads. After they disappeared with uninterrupted use of this exfoliant, it was easy for me to remove the remaining blackheads with just the tiniest bit of pressure. Three months in and my skin looks better than it ever has in 20 years, almost like a baby's bum. Because of the constant skin cell renewal this product provides, my dry flakiness is gone and makeup wears soooooooooooooo much nicer and scar indentations are less visible. I'm sooooooooooooo happy with this. LM71 - What a difference! I wish I had discovered this product before. Oh what a difference it has made to my skin. I have been suffering from blackheads and whiteheads on my forehead and chin area over the past 2 years (I am in my mid-forties) and redness on my cheeks. After just 1 application (I pat it on with my fingers), I immediately noticed the difference. The next morning, my whiteheads were calmer and 3 days later, all whiteheads were dried and healing. A few blackheads remain after 1 week. The redness on my cheeks has calmed down 50%, my skin feels smooth, matt and clear. Wow! My husband asked - what have you done to your skin? It looks really good. Amazing! I can not praise this product enough. It's been a year that I am using it and have been complimented not once for how great my skin looks. I use it 4-5 times a week in the evening. In that time of the month I aply morning and evening and those monsters dont have any chance. I highly recommend this product to anyone who wishes a clear, clean and fresh skin! Dullness is gone, no acnee, no pimpels, no blackheads! Customer Care: Thank you for your review. We are happy to hear that you are so pleased with this products. Consistency is key. I've been using this for 2 weeks and sadly this did not deliver my expectations... I have very oily skin with blackheads all over, massive pores and some deep wrinkles. This product has not cleared my skin or made my pores look smaller, it left a sticky and shiny film and made my pores look even bigger. I only use it at night as I'm not happy about the appearance of my face after I apply this.I've tried a few different application methods but nothing has worked. It might be my skin doesn't like BHA... I also use an AHA toner (different brand) and it works just great. Customer Care: Hi there! We're sorry it wasn't a fit for you! Be sure to contact our Customer Care for assistance! Sarah - By far one of the best products I have found! I have oily/combination skin. I have battled for years with both breakouts and super sensitive skin (allergic/eczema prone). Over the years I have learnt the hard way what does and doesn't work for my skin and these days I am very careful about the products I introduce to my skin. Now in my early thirties, I have the added concern of wanting to fight the onset of wrinkles! A nightmare combination of skin concerns to attempt to treat!! I have been using this BHA for around 4 months now and can honestly say I have seen a real improvement in my skin. I was a little weary when I first starting using this product (in case it triggered an outbreak of sensitive skin) so I only used the product once a day (morning) for about a month. I now use this BHA morning and night and have never experienced any sensitivity to the product. I have found that acne scars/marks heal much faster and the majority of my breakouts now only really happen around my period due to the spike in hormones. I have also found that the persistent milia around my eye area has pretty much all but gone (far cheaper and less painful than a trip to the dermatologist for removal!!). 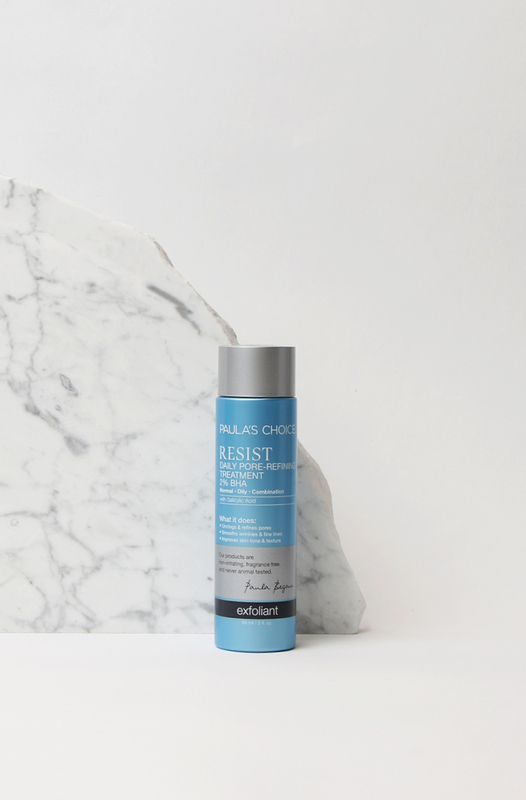 After the first month of using this BHA, I then introduced Paula's resist ultra-light super antioxidant serum, which I think has also really helped clear up breakout scars and glides onto the skin perfectly without clogging pores. My skin is smoother, brighter and more even, so needless to say I think this is an amazing product and would highly recommend it!! I chose this product after so much consideration - I was swayed by the fact that this product also had anti-ageing properties but the main functions I was looking for were to tackle breakouts and redness. In all honesty my breakouts aren't even that bad so I thought this would be fantastic after all the rave reviews. I've been using the product for a few weeks and I just don't see the improvement. I also read that this product would clear sebaceous filaments (this isn't advertised by PC) which I can't say that it has. It has refined my pores though so at least there's that.... Maybe I set my standards to high or maybe it just doesn't work for me. Who knows? I will not be re-purchasing and am internally crying about the product finding the trash heap. Love love love this exfoliator. I use this once a day and alternate with the clear regular strength. It's transformed my skin and if I ever go without it for a few days, I really notice the difference. Very disappointed in this product. I've been using it for just over 2 weeks and I have developed more clogged pores and active acne than I've had in years. There've been no other changes in my skin care routine and my skin had been clear for more than a year. Such a shame as I had high hopes for the claims made about this product, but alas, every Paula's Choice product I have tried over the past 7 years has caused me problems. Texture-wise this has an amazing feel on the skin, and it's quite hydrating which was nice. Customer Care: Thank you for your review. We are very sorry to hear about your experience and discomfort. Although this is not a common response, we do understand that each customer is uniquely different in how they respond to products or ingredients. Our Customer Care Team will contact you for a refund. This is AMAZING! I had marks and belemishes on my face and after using for only a week my skin looks clear like I'm always wearing foundation!! The pore size hasn't decreased but I was having hormonal breakouts every few days and now I haven't had any for a week . I had sensitised my skin by using too many products like acne treatments etc and now there is no redness on my face no dry patches no spots just smooth clear and plumped up! For the first time ever I have been going out in face powder instead of my foundation!! I can't believe how quickly it's worked I am goin to start using these products now and nothing else!